The potential for speech recognition on mobile devices is significant and already practical with new apps such as Dragon Dictation and Dragon Search despite limitations with the current free version. Human speech is processed and recognized through online servers that provide opportunities for inputting text without having to type. Learners who have difficulty typing (or cannot type at all) with the on-screen keyboard can quickly convert their speech into text for applications such as e-mail, taking notes, creating blogs, and searching information on the Internet. Currently the Dictation app is limited to 30 seconds, although it is possible to append the text for each 30 seconds until you have completed your dictation. Attach an external microphone to the iPod touch. Press Tap and Dictate and speak slowly and distinctly with minimal background voice. What you say up to 30 seconds will be processed and displayed on your iPod screen. You can either edit, copy, or e-mail the text. For Dragon Search say your search terms, which will be converted into text and then submitted simultaneously to YouTube, iTunes, Wikipedia, Twitter, and Google. Dragon Dictation - Converts what you speak into surprisingly accurate text. You will need a microphone for your iPod Touch of course. The process is simple: press Tap and dictate and start speaking - slowly and distinctly with minimal background noise works best. After 30 seconds Dragon Dictation will process your speech through online servers and display the converted text on your iPod screen, which you can either edit, copy, or e-mail. Although a bit cumbersome you can speak in segments of 30 seconds, appending your text each time so you can dictate for longer periods of time. Although the app is free for now, there is bound to be a paid version with more features. Dragon Search - Processes search results based spoken text with impressive accuracy, although certainly not perfect. As with Dragon Dictate you will need a microphone for your iPod. The process is simple: press Tap and Speak and say your search phrase distinctly with minimal background noise for the best results. Press the Done button and your phrase will be searched by Google, Wikipedia, YouTube, iTunes, and Twitter. For example, I spoke "Marcellus Shale" and Dragon Search found my tweet sent only minutes before - amazing. You can edit spoken text in the search box if Dragon Search does not interpret the search phrase as you expect. 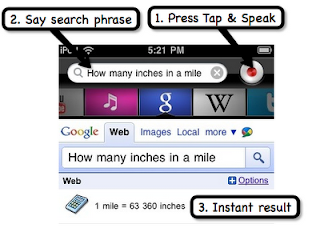 For instant answers dictate terms according to Google Search features http://www.google.com/intl/en/help/features.html . Try this example: say "How many inches in a mile", "72 inches in centimeters" or "2 tablespoons in ounces" to trigger Google Calculator, which immediately calculates and displays the results as shown below. Google Calculator does not recognize terms such as "square root of 987", although other web sites such as WikiAnswers will provide the answer once you open the page.